Overview: Samsung Remote App lets you control Samsung TV and BD products easily when you have them connected to the same wireless router. 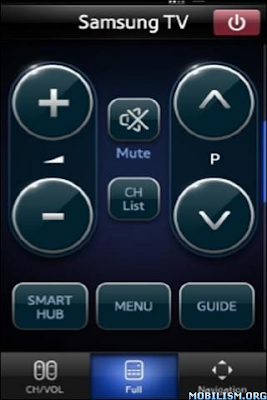 You can use your mobile device to turn on your TV using Bluetooth (available for certain TV and mobile devices only). Your mobile device can work as remote for your Samsung TV or BD products. Full remote screen is provided by default. Three tabs are provided at the bottom of the screen to help you control connected devices with ease. Onscreen keyboard shows up automatically when you need to enter text. With this feature, your mobile device can control games on TV. Full and Simple modes are available. Turn on Gyro function on your mobile device, and control games by tilting your mobile device. You can fine-tune and adjust gesture sensitivity on your mobile devices in order to control TVs and BD players. 1. Connect wireless/wired router to TV LAN port, or connect Samsung Wireless LAN adapter to TV USB port. 2. Connect your phone to wireless/wired router. 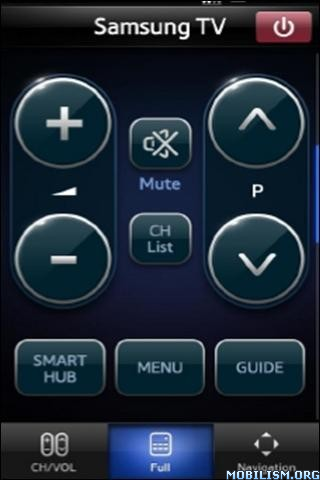 For the TV models list below, check if Wireless Remote Control or Network Remote Control is enabled in your TV’s System or Setup menu if the connection is not made. Note: Samsung App’s demonstration is available without connecting your mobile device to Samsung TV. Press Demo Play to see it. This app is optimized for WVGA(800*480) resolution screen. The app may not display properly in HVGA(320*480) or QVGA(240*320) resolution.